Claiming that Ukraine was on the verge of civil war—and acting as its leader in the absence of a formally recognized government, he asked Putin to intervene militarily in order to ensure the security and rights of ethnic Russians and their sympathizers in that southern autonomous region and they began to arrive there last Friday. According to estimates, over 20,000 foreign troops are positioned at military bases and government facilities on the peninsula and while warning shots were fired at approaching Ukrainian troops when they attempted to negotiate with the Russians on Monday, this has strictly been an overt display of intimidation—but not deadly force—by Putin. While it has attracted a lot of international press coverage, none of the actions that have already transpired in that far-flung corner of the world meets the definition of being an “imminent threat” to our nation’s security. However, if you were to sample the subsequent American media reaction to this “invasion”, one would think that the US—specifically President Obama—had capitulated our sovereignty to his Russian counterpart in a USS Missouri-like ceremony of defeat and surrender at the end of World War II. Citing a loss of “prestige”, NBC’s Meet the Press moderator David Gregory openly wondered Saturday evening about the costs to Putin concerning his disregard to Obama’s public warnings about intervention. On his weekly show the following day, he and fellow journalist Chuck Todd hammered home the point that there is a growing perception of American “weakness” because we had not done anything to stop or deter him. While some in the news business tried to examine the causes and possible end-states posed by this action, the outrage was turned up to “11” in the political realm. Republican senators John McCain and Lindsey Graham took to any media outlet they could find—including, surprisingly, Al Jazeera America—to trash the president for his “feckless” foreign policy. Former Alaskan governor Sarah Palin weighed in on Fox News on Monday evening and blamed him for failing to achieve "peace through strength that only can be brought to you courtesy of the courtesy of the red, white and blue" because of how his alleged “equivocation” and “bloviation” are no match for the muy macho Putin. 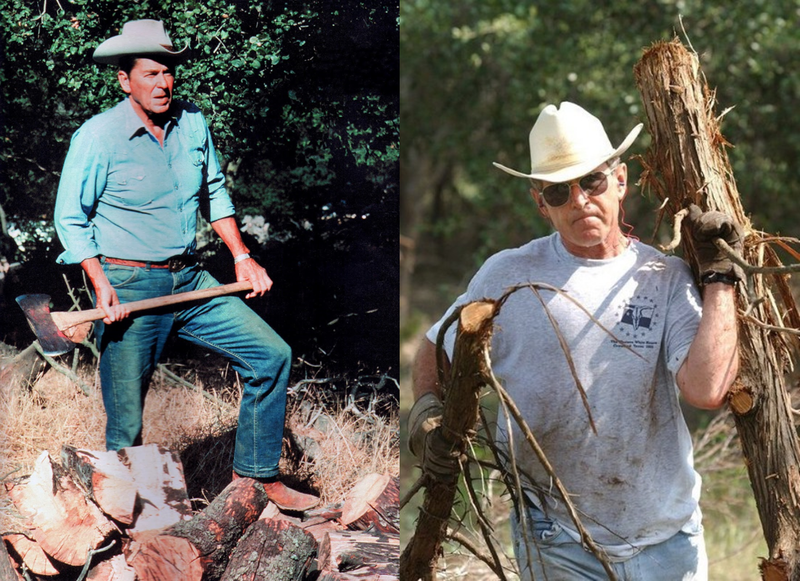 Presidents Ronald Reagan and George W. Bush adopted cowboy personas to solidify their credibility with the "common folk" and to project a "tough guy" persona to the rest of the world. Her opinion appears to be based solely upon imagery she has seen in the media—a shirtless Putin striking a tsar-like pose on a horse versus the US president wearing relaxed-fit “Mom” jeans when throwing out the first pitch at the 2009 Major League baseball All-Star game. Such blatant masculine symbology resonates strongly within the American conservative movement and this finding is widely believed to be the reason why Ronald Reagan and George W. Bush bought ranches in California and Texas, respectively, prior to launching their presidential bids. 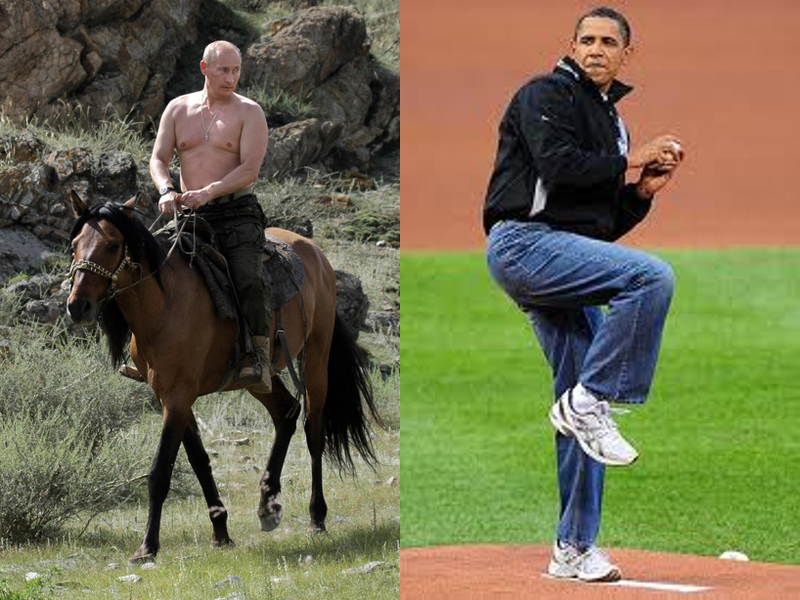 During their terms in office, both used those locales extensively for vacationing and numerous gratuitous photo ops dressed in cowboy garb to solidify their credibility with the “common folk”--even though both were rich men before entering the White House--and to project a "tough guy" persona to the rest of the world. Scathing critiques by Republicans are nothing new to our 44th president when it comes to how his administration conducts foreign policy. When Navy SEALs killed al Qaeda leader Osama bin Laden in May 2011, several of the Republican contenders for the following year’s presidential nomination could not share the credit with that unit’s commander-in-chief for that historic accomplishment. When President Obama secured a comprehensive nuclear weapons treaty with Russia in 2010, a sizable number of GOP lawmakers who had enthusiastically approved a similar measure under a Republican president just seven years earlier suddenly demanded information on verification procedures—a feature that the 2002 treaty did not address and one they could care less about at that earlier time. Up until this most recent crisis, the international situation that attracted the most animus from Obama’s detractors was the civil war in Syria. Republicans were absolutely verklempt with the president for not following through on the “triple dog dare” use—and then sudden retraction—of a “red line” military strike threat when he was able to arrange an eleventh-hour diplomatic solution for removing that war-torn nation’s chemical weapons arsenal through pressure applied by their Russian ally. McCain, Graham and the usual cast of administration detractors called it “morally and strategically irreprehensible” not because it left the Syrian strongman in power but because not following through on the threat supposedly made America look weak on the world stage. As our nation’s leader, the president has a variety of diplomatic, economic and military tools at his or her disposal to obtain a response or a favorable resolution to an issue or situation. They are listed above in their proper order of implementation and severity; unfortunately, the previous administration normally skipped over the first two in order to grab the military “cudgel” to the delight of conservative supporters and a military-industrial complex that has grown exponentially since the September 2001 terrorist attacks in New York City and our nation’s capital. With one war ended and another scheduled for termination later this year, proponents of martial remedies in foreign affairs will be hard pressed to justify the previous spending levels for such resources—unless another “crisis” can be identified and prosecuted on the taxpayer’s dime. Granted both sides’ troops are proxies at its epicenter, the current situation in Ukraine will not have a military solution and can only be resolved with the proper application of diplomatic and economic disincentives to hurt Putin enough to bring him to the bargaining table. Based on the lessons of Russian history, this might require a deal that will not sit well with either side—the annexing of the Crimean peninsula and eastern regions to Russia (to correct Nikita Khrushchev’s somewhat shortsighted decree back in 1954) in return for Ukraine’s admission to pro-western organizations such as the European Union and NATO. Only when both sides feel more secure within their proximate quarters can they move on from their 1991 political dissolution towards their eventual independent national destinies. To get that process started, all parties need to understand the history behind and the gravity of these difficult negotiations and we can only hope that these delegates will rely more upon the principles of realpolitik than those employed by the steady consumption of social media.